Nassau is a city on New Providence Island in the Bahamas archipelago. The Bahamas are often the introductory destination that many vacation travelers experience on their first cruise. Three- or four-day cruises leave from Miami, Ft. Lauderdale, or Port Canaveral and sail the short distance to Nassau or to Freeport in the Bahamas, giving first-time passengers a taste of cruising. The Bahamas are only fifty miles from the United States. The 700 islands stretch over 100,000 square miles of sea from the eastern coast of Florida to the northern coast of Cuba and Haiti. The Bahamas derive their name from the Spanish phrase ​baja mar, which means shallows. Thousands of cruisers are in Nassau every weekend. Nassau is a perfect combination of British heritage and colonialism along with modern resorts and picturesque beaches. Nassau is located on the island of New Providence, which is about 21 miles long and 7 miles wide. The city is compact and can be explored easily on foot in a few hours. Cruise ships dock at piers on the north side of the island, a 10-minute walk from the center of the city. The modern pier, known as Prince George Wharf, is only one block from famous Bay Street, the main shopping street of Nassau. When your cruise ship docks, you will find plenty of taxis waiting to take you around the island. When you are in Nassau for the day, you can either take a shore excursion sponsored by the cruise ship, book an excursion on your own, or use the time to explore the city, the island or a beach. Because of the tropical location, many tours are water-related. Boat trips, a tour of Nassau or the island, snorkeling or diving, golf, swimming with dolphins, or exploring on a submarine are all popular tours. Don't forget the food on Arawak Cay. Many cruise passengers buy a day pass to the huge Atlantis Resort on nearby Paradise Island. If you decide to not take an organized shore excursion, stop off at the Bahamas Ministry of Tourism near Rawson Square. They can help give you a really good sense of what to see and do in Nassau. You can't miss it — you will see it when you exit the cruise ship pier. They can provide maps, directions, and other information. If you are exploring the city on foot, it certainly helps to know what you are looking at. Recorded Bahamian history starts with a date familiar to many of us — October 12, 1492. Christopher Columbus made landfall in the New World on an island in the Bahamas that he named San Salvador. Neither Columbus nor the explorers who followed him ever found gold or riches in the islands. European settlers first came to the Bahamas in 1648, but the late 17th century found the Bahamas full of pirates such as Edward Teach (Blackbeard) and Henry Morgan. The British managed to bring the islands under control by hanging many of the pirates, and the Bahamas became a colony of Great Britain in 1728. The islands are still part of the British Commonwealth of Nations, and British culture and traditions are seen in Nassau. There is a statue of Queen Victoria in front of the Bahamian Parliament, and the Queen's Staircase was built to honor Queen Victoria's 65-year reign. Edward, the Duke of Windsor, who abdicated the throne of England for the woman he loved, was governor of the Bahamas from 1940 to 1945. Since the Bahamas are so close to the United States, they have played an interesting role in the history of this country. In fact, the Americans captured Nassau and held it for two weeks during the Revolutionary War. The Bahamas also were involved with the United States during two storied eras of our past — gun-running during the Civil War and rum-running during Prohibition. 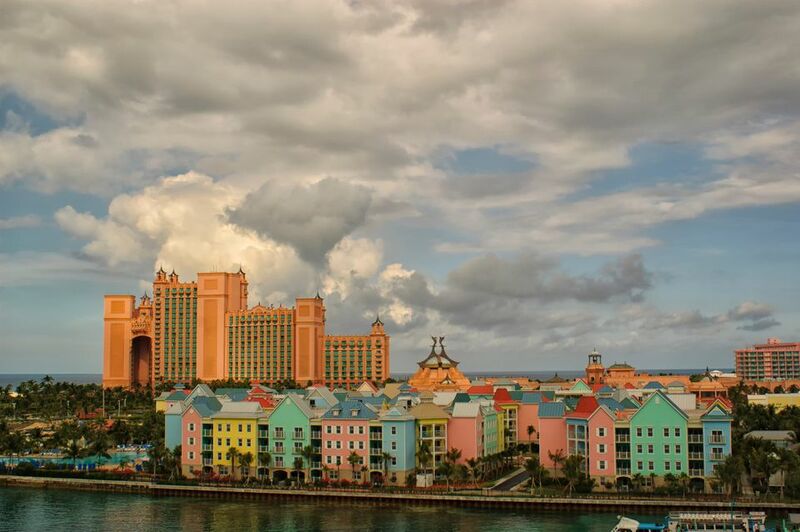 The relationship between the Bahamas and the United States may not be quite as exciting anymore, but Americans invade the islands each week via cruise ship or airplane bringing welcome tourism dollars into the Bahamian economy. Many tourists believe that Nassau is the best of both worlds. It is modern enough to have the tourism infrastructure work well, the economic conditions are better than much of the rest of the Caribbean, and nothing in the city is so "unfamiliar" to make less well-traveled tourists uncomfortable. At the same time, Nassau has just enough of the exotic side to make you realize you're not at home anymore. When you step off the ship and see the police, dressed in their "bobbie" uniforms and directing traffic that is driving on the left, you will immediately realize you've left home. The old colonial sites, the lilt of the British language influence, and the West Indian people and festivals help make Nassau a fascinating destination. Nassau is stretched along the northern coast of New Providence. The city is compact and easy to leisurely explore on foot. As you stroll the city, absorb the colonial history and allow time to look for bargains in the shops and straw markets. Cruise ships usually offer a shore excursion of Nassau and the famous Ardastra Gardens. This tour usually includes a walk down Bay Street to the Queen's Staircase and a visit to Fort Fincastle and Fort Charlotte before concluding at the Ardastra Gardens. New Providence Island is only 21 miles long and 7 miles wide, so it is easy to see in a few hours via bus, car, or moped. Shore excursion tours often combine a tour of Nassau, some sightseeing, and time at the beach. Or pay a visit to the famous Atlantis Resort. If you have spent time in Nassau before, you might want to take an excursion outside the city, which can be booked on your cruise ship or in Nassau.